On Sunday, Nov 29, team Bear Necessity Korea made its way to the much anticipated Bear tree Park, located in Chungchondong, a 90 minute train ride from Seoul. Bear Tree Park is open year round and closes at sunset. We had mixed expectations about the Park, having received reports of poor conditions from well respected associates in the animal welfare community. One thing we all agreed upon was that the owners, who are former bear bile farmers, apparently possess vision beyond bear bile farming and had invested an enormous amount of money in making the facility beautiful. Curiosity aside, we hoped to get a feel for the reality behind the uplifting vision stated on the park’s website by Founder Lee Jay Yon, and to see the 100-150 bears and their living conditions. Unfortunately, weather did not favour us that day and rain drizzled with temperatures dropping steadily, but we were in good spirits as we approached the entrance to the park. A well known destination for tourists, the park is a 5 minute taxi ride from the train station and all drivers know it well. Admission was KRW 7500, and the first (and last) place we ventured to was the vivid souvenir shop at the gate which featured a creative plethora of bear-centric goodies that inspired us to pull out our credit cards; we had never seen the Asiatic black bear featured in merchandise outside of the animal welfare community and this shop has their products well chosen. They feature stuffed animals, stationary, oils, incense, candles, hand phone accessories, perfume and eatables to name a few. The prices are a little hefty, but the goods are appealing and the selection is impressive. We proceeded into the park and began wandering through the many greenhouses, Koi inhabited lakes, art exhibits, seasonal decorations and gardens, all of which were extremely well manicured and exotic. At every turn, we were greeted by images of our beloved moon bear, which resulted in hundreds of photos and created a tranquil environment for the 5-10 tourists wandering with us, despite the rainy conditions. As an attractive tourist destination for families seeking shopping, flora and fauna, the atmosphere doesn’t disappoint. Approximately 2 hours into our visit, we found what we’d been seeking: The Bear Village and surrounding Pet Area. For me, this was the first time I’d seen moon bears up close, an amazing experience; in some cases, inches away from my face. That said, the lack of enrichment and adherence to ethical guidelines (as prescribed by doctrines written by established groups such as Animals Asia and The World Association for Zoos and Aquariums – WAZA), was truly disconcerting. 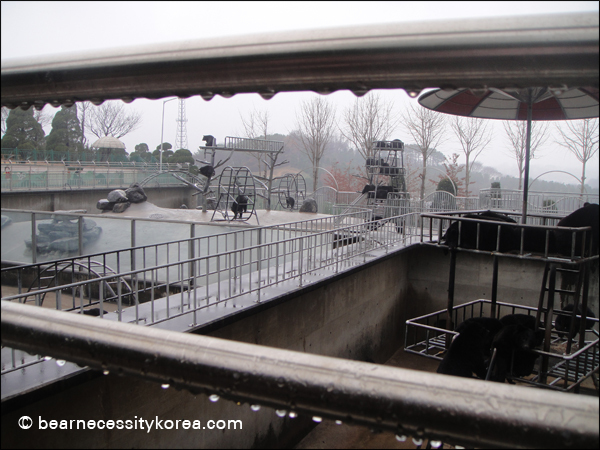 In fact, the conditions under which the bear lived were painfully similar to those under which they’d exist in a Korean bear bile farm, though it appeared the intentions are generally good. In our opinion, it is unlikely the owners possess the expertise necessary to provide ethical care for their bears at present. This remains unknown. We were in agreement with a report we received in July 2009, which addressed the Facility conditions. Consistent with the findings by our associates, roughly 30 bears are still confined in the same cramped farm cages which The cages are situated in a row in the middle of the park. This area is not labelled on the site map and there are no signs at all explaining the bears’ presence, and none suggesting the bears’ housing conditions will be improved. The cages, each a few metres square, are surrounded by high banks of vegetation. Inside they are bare and dirty with troughs of green water and no sign of enrichment of any kind. 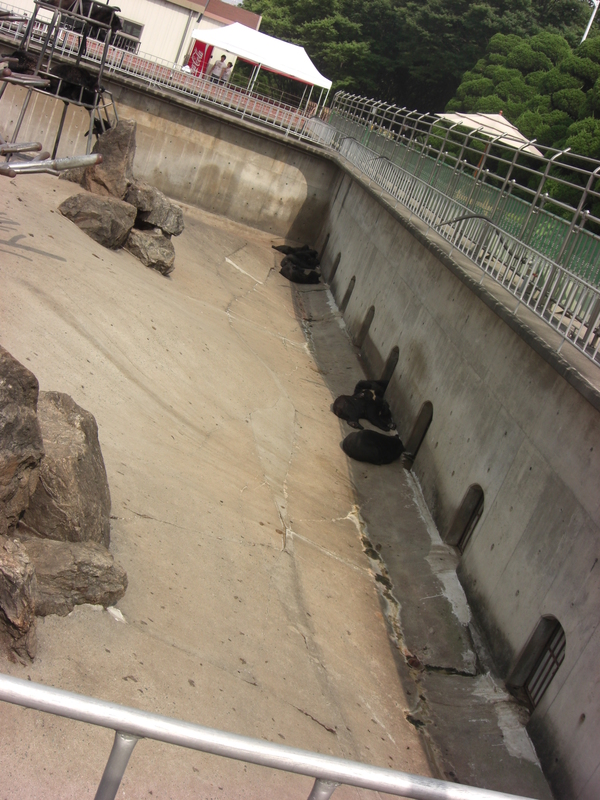 The sleeping compartments provide an area where the bears can partially retreat from human eyes, but contain no bedding material to mimic a natural setting. In the 2009 report, it was found that several bears, many of whom have yellow ear tags, paced the tiny areas and several more were bar-biting; an indication of stress. The only ‘enrichment’ opportunity appears to be that some of the cages open onto each other, so some bears are free to mix. However, this also leads to fighting and constant breeding in the confined spaces. Bear Necessity Korea also noted the lack of shelter, though in lieu of burning summer sun, there was rain during our November visit. We witnessed numerous acts of aggression by bears and noted that no staff members were present at any animal section. Several bears showed signs of skin conditions and rubbed incessantly against the metal bars in their enclosures. The bears appeared listless and occasionally agitated by confrontations with other bears. 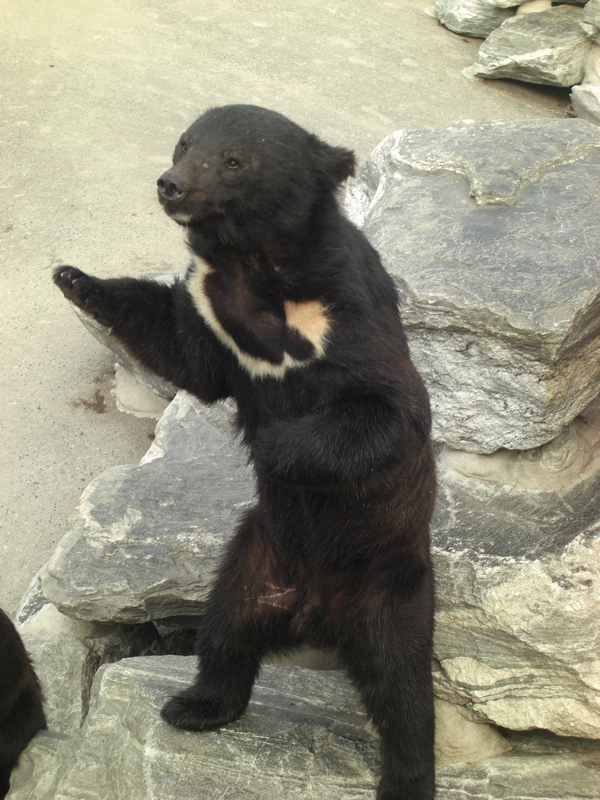 One of our volunteers, a new comer to Asia, commented on how lifeless the bears seemed to her. Despite her lack of knowledge about proper captive bear care, she immediately noted that the conditions seemed “inadequate and sad”. A short distance from the cages is Bears Village, which houses roughly 100 bears. This area is closely modelled on Japanese bear parks and consists of four different-sized sunken concrete pits, each roughly 10 by 20, 30 or 40 metres in size. The floors and walls of the pits are bare concrete and each contain one or two piles of rocks, small concrete pools filled with scummy green water, giant metal ‘hamster wheels’ (the concept of which I found to be surreal), metal climbing frames, metal ‘trees’ and platforms. Again, shade is at a minimum – many bears cram themselves into the shadows of the high walls or rocks, which diminish with the movement of the sun or rain. During their July trip, our associates noted that air conditioned buildings and picnic tables with wide parasols surround the pits, suggesting that shade and cool temperatures are considered necessary for the bears’ human counterparts. No fresh drinking water was provided for the bears other than the dirty pools. The pits have small arched doors in the walls, which were all shut at the time of our visit, but presumably lead to underground sleeping quarters. Although the walls appeared to have cavernous interiors blocked by potentially leveraged bars, we were unable to see inside to determine whether any bedding was provided, perhaps for the hours after sunset during which the farm is closed. There was no provision of areas where the bears can retreat from human eyes or each other. Despite being an improvement on the cages, the pits are greatly overstocked with roughly 20-30 bears in each – leaving only a few square metres of space per bear. This obviously leads to a unavoidably large quantity of faeces being produced in a small space. On the day we visited, the only evidence that the bears could be hand-fed by the public (apart from their begging behaviour), was a sign in Korean stating ‘If you feed the bears they will dance (! )’, which we found troubling. The bears did in fact, react to our presence in a manner that suggested they were regularly fed by tourists. We saw donation boxes for the public to contribute to food costs. It was not apparent how the bears are handled in respect to their nutrition when there are no visitors. The floors of the pits were dotted with piles of soft, putty-coloured excrement which indicates that the bears’ diet is entirely unsuitable. In the wild bears are omnivorous and consume a variety of foods including berries, roots and shoots, insects and occasionally, carrion. Overall, there is nothing to suggest that they are receiving sufficient fibre and their protein and vitamin requirements are almost certainly at marginal levels. Near the entrance to the park is an area called Pet Garden, which consists of a collection of small bare enclosures and aviaries housing domestic animals such as sheep, peacocks, chickens, deer etc. Occasionally we saw a free wandering peacock or fowl that had apparently escaped or had been intentionally allowed to wander, but no staff were present throughout the duration of our visit save for those in the dining facility and craft/souvenir shops, several of which were closed. In their 2009 report, our associates had found a member of staff with a baby’s milk bottle coaxing a tiny fawn along the path for the benefit of the visitors. Bear Tree Park also has a small herd of deer on site, remnants from deer farming, in an equally bare enclosure. Further on we came to a glass-walled enclosure roughly 10 by 20 metres in size. Within were several Moon bear cubs, all a few months old. Wild bear cubs stay with their mothers for up to two years, so to be separated at this early age is unnatural, despite the fact that these bears will likely spend their lives in captivity. The bear cubs were drawn to our presence and scurried over to beg, though there were no signs warning visitors not to touch the animals. We did observe stylized signs posted on some pens, providing given names for certain individual bears (see gallery below). We noted a lack of educational materials or informative signs surrounding any of the enclosures. Ironically, the sign for Bear Tree Park and wall mosaics depict the bears against a spacious natural green forest backdrop – though the bears in the park have no access to such habitats themselves, and there are no signs to suggest such improvements are planned. In the sculpture areas, the bear statues had significantly more space and better landscaping than the live bears themselves. The cub’s enclosure had bare concrete floors and little shade apart from a plastic igloo. There was no provision of bedding. There were also metal climbing frames and smooth tree branches, stripped bare of their bark, which the cubs climbed enthusiastically to get attention from us, clearly inquisitive. There was fresh water provided in the form of a small, shallow trough filled by a dripping tap and the cubs climbed over each other to sit in this cool water, but there was only space for one small bottom at a time. In its current state, Bear Tree Park fails to meet the needs of all its captive bears, though certainly some more than others, and gives the public a negative educational message about animals in general. 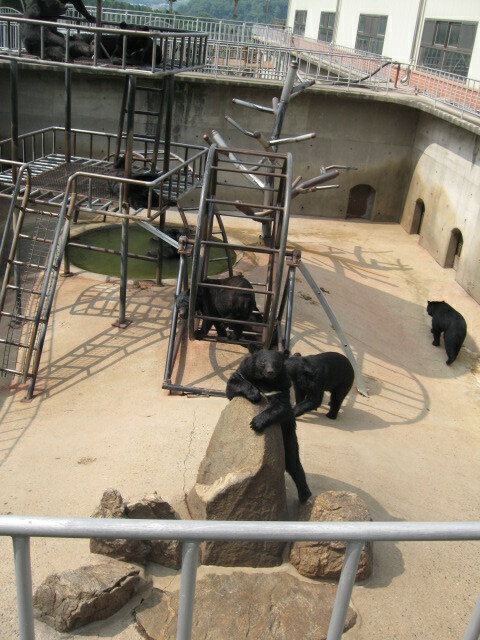 The South East Asian Zoo Association (of which Seoul zoo is a member) and the World Association of Zoos and Aquariums (WAZA) Codes of ethics provide basic standards on exhibiting animals to the public, including allowing them to express natural behaviour, allowing animals sufficient space, allowing animals to withdraw from view and contact with people, and displaying them in a natural enclosure. Bear Tree Park fails on all these criteria. Bear Tree Park is an indisputably unique and beautiful property in Korea. In our opinion, it has enormous potential as an ethical location for bears, should the owners take interest in implementing changes to uphold WAZA standards, or those of a sanctuary (an even tougher challenge, as sanctuaries mimic natural settings and Korea’s farm bears tend to have significant health issues). The gardens and greenhouses are inarguably ‘tranquil and exotic’, and the meticulously cared for sculptures and artwork kept us enthralled. We hope that one day, this park may become something more than a glorified bear farm; stocked with pretty plants, flashy merchandise and cheap theatrical tricks and generating income but failing to provide the care these animals deserve. Bear Necessity Korea is pursing precisely this; and your support is invaluable to us. Our hope is change; the owners of Bear Tree Park have the opportunity to become pioneers in Korea and to prove that Care and quality truly do come before consumerism. All images owned by Bear Necessity Korea. The cages, each a few metres square, are surrounded by high banks of vegetation. Inside they are bare and dirty with troughs of green water and no sign of enrichment of any kind. The sleeping compartments provide an area where the bears can partially retreat from human eyes, but contain no bedding material. In these cages, The only ‘improvement’ appears to be that some of the cages open onto each other, so some bears are free to mix. However, this also leads to fighting and constant breeding in the confined spaces. No shortage of merchandise here!